About Simple Green | Hy-Cor International Inc. 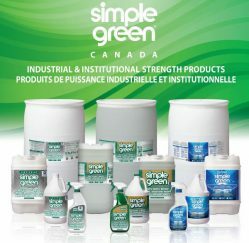 Simple Green® Canada has a full lineup of environmentally aware, biodegradable products to meet all your industrial and institutional cleaner and degreaser needs. Hy-Cor is excited to introduce our newest product line. Simple Green® has a full lineup of environmentally aware, biodegradable products to meet all your industrial and institutional cleaner and degreaser needs. S’il vous plaît Cliquez ici pour obtenir des informations sur les produits en français. Merci! NSF rated Crystal Simple Green® clear, unscented liquid and foam are non-toxic, biodegradable and non-corrosive. Safe for use on metals, finishes, plastic, rubber and more. Use Crystal Simple Green® for equipment and machinery degreasing, food processing and handling facilities, surface prep for painting and plating, manufacturing and MRO cleaning. Foaming Crystal Simple Green® is great for hard-to-reach and vertical surfaces. Simple Green Safety Towels™ are quick and versatile, pre-moistened with Crystal Simple Green® on dual-sided material with non-abrasive soft & scrubbing sides. Unscented and NSF registered, safely removes grease, oil, wet paint, carbon, graphite, tar, soot, etc. SDS Available upon request for all products. EXTREME Simple Green® Aircraft and Precision Cleaner is also biodegradable, non-abrasive, non-corrosive and non-flammable. Residue-free rinsing. Passes various aviation industry testing (available on request). Ideal for engines, aircraft, vehicles; metals, plastics, high tech alloys; parts washing; surface prep for painting and plating; manufacturing and MRO degreasing. Crystal Simple Green® can be used at full strength straight from the bottle, for example in parts washers, or diluted with water up to 1:50 for carpet and upholstery cleaning. Depending on your application, your cost per usable gallon could be as low as $0.44*. See the full chart linked below for other Simple Green® product ratios. * Based on a one gallon jug diluted at 1:40 ratio. See the full cost per usable gallon dilution ratio chart here.